Visit Cambria, California this fall to be enchanted by history, mystery, and more. Autumn events transform the town into a magical place that visitors have to see to believe. Restaurants, wineries, breweries, purveyors, history, and mystery fill this quaint, quiet village year-round, and with the subtle stirring of the autumn breeze, Cambria comes to life. Cambria, California, a pine-studded coastal hideaway, transforms each year into a frenzy of fall activity. 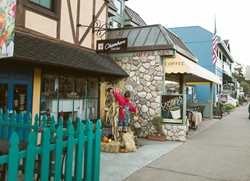 Restaurants, wineries, breweries, purveyors, history, and mystery fill this quaint, quiet village year-round, and with the subtle stirring of the autumn breeze, Cambria comes to life. From charming events to spooky secrets, this Halloween-loving town has it all. Visitors may want to hunt treasures in Historic East Village or embark on the Historic Cambria Walking Tour, which visits places like the Bucket of Blood, a saloon built in 1893. The Cambria Scarecrow Festival is where whimsy runs rampant. This month-long brigade of lifelike scarecrow displays draws quite the crowd in October. The Twilight Tour of Hearst Castle is hauntingly beautiful, though it may leave you with more than a few goosebumps. Every year, numerous visitors flood the streets of this strange place and find themselves spellbound. There is no need to fear feeling the magic of Cambria. We may not be psychic, but we know you will be visiting soon. An intimate eatery in Cambria, sample such unusual appetizers as stuffed fried green olives, or sage and mushroom gnocchi. Try hearty entrees such as roasted duck breast with dried cherry quinoa risotto, or a three-cheese baked polenta with eggplant and red chard. Desserts include mascarpone ice cream over pound cake with basil syrup, and a salted caramel tart. A speakeasy-themed wine lounge, the Black Hand Cellars tasting room offers outstanding red wines and even better stories. Just make sure when they put you on their “Hit List,” it’s the one referring to their wine club… you never know when it comes to the Black Hand Mafia. Hide and Tallow is a small company devoted to producing quality leather products, made in a good way, and sold at a fair price. All of their products are handmade by Karin and Ty Smith, a husband and wife team who have been crafting together since they met. When they say handmade, they mean hand-dyed, hand-cut, hand-punched, hand-sewn, and hand-finished. No machines. Period. Step behind the hidden gate to find this charming antique shop containing a collection of 1800s and early 1900s antiques and furniture, with an emphasis on American primitives. Spellbound Herbs Gift Shop & Garden is located in one of the oldest buildings in Cambria, originally an 1870s homestead. Wander through the shop to see the many pleasures and specialties they have to offer, and be certain to also take a stroll through their beautiful gardens filled with sweet smelling herbs and flowers. Greystone Manor was built by the original developers of Cambria as their private residence around the same time as Hearst Castle. This grand English Tudor Mansion, a historic Cambria landmark, includes a main manor plus guest cottage and carriage house. The luxurious estate is over 9,600 sq. ft. on 1.3 acres amid graceful moss-filled oaks and a variety of other trees, including a 100-foot eucalyptus given to Greystone by Hearst. Winding brick paths meander through beautiful gardens. According to local history, some of the materials used to build the home were originally purchased by William Randolph Hearst and were gifted or sold to the original owner. These items may be seen today and are still in their original condition. The Santa Rosa Chapel, a National Historic Registry landmark and one of the oldest churches in the County, was built in 1870. It served the community for 91 years. Guests of William Randolph Hearst, including Marion Davies, Gary Cooper and Bing Crosby, attended Mass there. The cemetery is the final resting place for many Cambria pioneers. After its closing in 1963, the chapel, gardens and cemetery fell into a state of neglect and disrepair. In 1978, the Santa Rosa Chapel committee was formed, spearheading a seven-year restoration project. The Chapel was rededicated for community use on September 16, 1984. This October, more than 400 imaginative and lively scarecrows will line the streets of Cambria’s East and West Villages, Moonstone Beach and San Simeon. The scarecrows are the perfect manifestation of Cambria’s incredibly artistic community. Attend the kick-off party on Thursday, October 5 at the Cambria Nursery & Florist, where the winning scarecrows will be announced, and visit the scarecrows all over town throughout the month of October. Beginning on Tuesday, October 3 and continuing through Christmas Eve, Hearst Castle will feature a Living History Program that emphasizes the lush lifestyle of the estate. The castle is fully illuminated on this two-hour-long evening tour, as docents in period dress bring history to life. Hearst Castle is one of many must-see attractions on the Central Coast, and is only six miles north of Cambria.